BodyArmor is 95% simple sugars and virtually no complex carbohydrates. e-Fuel provides energy via complex carbohydrates without all the sugar, more sodium and anti-oxidants, and it cost less than half the price! 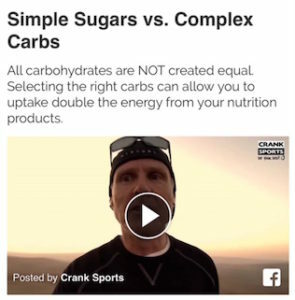 Watch this short video (right) to see why the complex carbohydrates in e-Fuel can provide you with significantly more energy than the sugars in BodyArmor. Electrolytes are critical to maintain hydration and to avoid cramping and injuries. Sodium is by far the most important electrolyte for endurance athletes, and the levels in e-Fuel are designed to meet the recommendations of the American College of Sports Medicine. Antioxidant vitamins C and E help protect against tissue damage, reduce soreness and aid in the recovery process. e-Fuel has more than twice the antioxidants of BodyArmor.